After accidentally purchasing 5,000 Microsoft Points while chewing on his owner's Xbox 360 controller, Oscar the dog has been officially recognized by Microsoft as the service's first canine member - and given his own Xbox Live account. 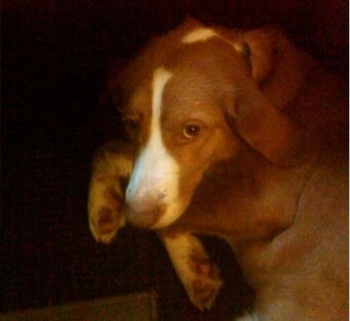 Last week, we learned about the story of Kotaku user Greg, whose furry companion - a Lab/Hound mix named Oscar - attacked the Xbox 360 controller while his owner slept. According to Greg, while chewing on the controller, Oscar managed to somehow turn the console on and purchase 5,000 Microsoft Points for his owner's account, which was discovered the following morning when Greg found the confirmation from Microsoft of the $62.50 transaction in his email. "People spend tens of billions of dollars on their pets every year," said a MS spokesperson, "but it's pretty unusual for your pet to return the favor (except in love and tail wagging of course)." The Redmond-based software giant will be refunding the points, setting Oscar up with his own Xbox Live subscription and gamertag (with some extra points thrown in so the dog can buy 'Splosion Man, of course) and sending Greg a brand-new, not-chewed-on controller.